The club has high-speed broadband connectivity throughout and this service is offered to all members and their guests. There are six private rooms in the club, each offering a private bar, LCD screen with laptop interface, internet connection, DVD player and iPod dock. 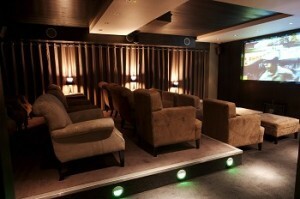 The club also offers a private cinema with seating for 18. There is no formal restaurant at Eight Bank EC3. We do however offer a lounge menu, available from 8.00am for breakfast and continuing throughout the day until 10.00pm. The menu offers a combination of light snacks, sharing options and few more substantial dishes. The Private Dining Room is available for up to 16. Eight Members Club, Bank, is a private club located in the heart of the City of London. Situated opposite the Royal Exchange just off Cornhill in the historic Change Alley, the club offers members and their guests a wonderful venue to relax, meet friends, work and socialise. On entering the club, descend the stairs to the Members Lounge and our Club Reception where members are greeted and have their cards confirmed. The Lounge is an informal open-plan space where members can eat and drink, work in one of the private rooms or play pool on one of the three championship Brunswick tables.